It’s good to welcome new recordings of Respighi works other than the perennially pleasing but ubiquitous Roman trilogy. That’s especially true of the Rossini-inspired Diaghilev ballet La Boutique fantasque (The Magic Toy Shop). Indeed, although the latter follows Impressioni brasiliane in this programme it’s clearly the main attraction. 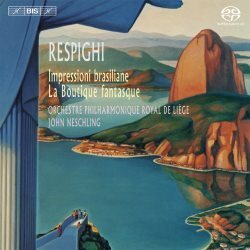 Most intriguing is the collaboration between Brazilian conductor John Neschling, who made his first Respighi recording for BIS in 2008 (review), and this rarely heard Belgian band. As always BIS make a virtue of unexpected partnerships, so I fully expect something rather special here. That said, I don’t always warm to Neschling’s music-making, although I do admire his pioneering work with the São Paulo orchestra. His Hindemith doesn’t really challenge the best in the catalogue (review), but his disc of Bernstein, Barber and Bloch with Vadim Gluzman is much more satisfying (review). I also recommend his Tchaikovsky and Medtner concertos with Yevgeny Sudbin, which Chris Howell welcomed on its appearance in 2007 (review). As for the Liège orchestra I’ve only heard them once, and on that occasion they made a favourable impression (review). Brazil seems to have done the same for Respighi, who visited the country in 1927 and 1928. The three-movement Impressioni brasiliane – part of a promised suite that was never completed – begins with a tropical night that’s alive with exotic sounds, all of which are superbly rendered in this new recording. Until now I’ve thought JoAnn Falletta and her Buffalonians excellent (review), but Neschling’s glowing colours and instinctive rhythms are simply breath-taking. That entwining, liana-like oboe tune is magical, too. By contrast Geoffrey Simon (Chandos) seems a little rough and approximate, mere daubs that don’t do justice to Respighi’s painterly prowess. In the past I’ve grumbled about BIS’s frustrating balances, which make the music seem a tad opaque at low volume. This time it’s all so delicately aspirated and the ultra-refined sound is a joy to behold. Couple that with sensitive, finely honed playing and you have your very own piece of paradise. As for the snakes Respighi saw at the famous reptile farm in the Butantã district of São Paulo they are more unsettling in the Simon recording; not only that, the Dies irae is spookier too. Neschling shapes and shades the music most beautifully – superior woodwind and immaculate pizzicati to the fore – and imbues it with a rare subtlety and narrative strength. Ditto the Song and Dance, which pulses to the gentlest beat. I’ve seldom heard Respighi essayed with such finesse and feeling; indeed, I had to play the piece several times in quick succession, such is the magic it engenders. This could be a very promising partnership – if it turns into one – a belief that only grows with Neschling’s lively, incident-packed La Boutique fantasque. Based on Rossini’s piano pieces Péchés de vieillesse – I reviewed some if them here – the ballet revolves around two cancan dolls who come alive and fall in love. It's all so effervescent - Arthur Fiedler's two RCA recordings certainly have enough fizz to pop anyone's cork - but there's more to this music than just bubbles. The overture moves with the insouciance of a seasoned boulevardier out to make a good impression. Respighi’s homage to his irrepressible forebear can be heard in the twirl and turn of every tune; meanwhile Neschling strikes just the right balance between mobility and weight, and his players respond with panache aplenty. The shade of Offenbach is never far away, especially in the more rumbustious moments, and it’s difficult to suppress a smile at the teasing geniality of it all. True, it’s not one of the greatest of the Diaghilev ballets but it’s one of the most delightful; just sample the Tarantella, which is dispatched with an ideal blend of good humour and good taste. The big-boned Mazurka mixes vigour with a certain charm, but thankfully climaxes are always well proportioned and playfully done. Rhythms are sharply pointed and the percussive plosions of the Cossack Dance are a knock-out. Neschling also brings a metropolitan lift and lilt to the proceedings, not least in the Cancan. Everyone is having fun, and I daresay most listeners will experience that same leap of pleasure on hearing this lovely, levitating performance. The ensuing Valse lente isn’t the lightest of confections, but it’s leavened by some gorgeous, gurgling woodwind. The felicities of this score extend to the atmospheric, harp-led Nocturne; this really is music that brings to mind Keats’s ‘blushful Hippocrene’, for it plashes and plays with a profound serenity that’s most affecting. Needless to say Neschling and his northerly band infuse the writing with plenty of southern warmth. The concluding Galop is a perfect fusion of these two worlds, at once cultivated and carefree. It’s a judicious bit of juggling on Neschling’s part, and I’m delighted to say he never drops a ball. Which is why I’d urge you to bin your other recordings of La Boutique fantasque; really, this is the only one you’ll ever need. Elegant and engaging; Respighi performances don’t come much better than this.